One of the best things to do on Maafushivaru is to spot the biggest fish in the world – whale sharks. Located in South Ari atoll, Maafushivaru is an hour’s drive away to the famous local island ‘Maamigili’, the prime site for seeing whale sharks in great numbers. Embark on a dive trip or on a guided excursion with the resident marine biologist to witness this amazing once in a lifetime experience with the shark that sports the widest grin. Wake up early and grab a hearty breakfast at Cuisine Gallery before the expedition. Carrying a bottle of water and keeping well hydrated is a wise decision before the exhilarating swim to keep up with the whale shark. You leave Maafushivaru at 0900AM and the boat ride lets you see the beautiful islands of the Maldives. The guide on board explains in-depth information about the whale shark, highlighting its habitat, its life span and why and how it appears on the surface. Within moments, you reach your destination and you’re given a short brief on the proper etiquette to swim with a whale shark. One must keep in mind to keep a considerate distance with the shark to avoid any injury as its one single fin thrust can equate to 10 kick cycles of an average human being! After sighting the exact location of the magnificent animal you jump off with a guide and paddle your way to watch the gentle giant soar the waters with grace and majesty. The first sight would leave you awestruck with the beauty of nature, and soon you’d be rushing to take photographs and videos as proof of your bountiful search. 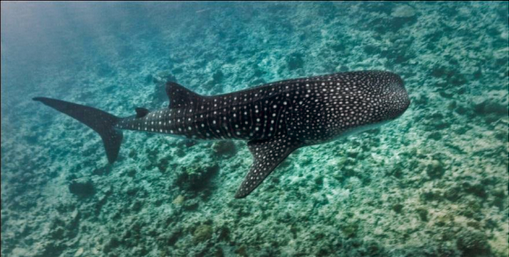 Whale sharks are a protected species in the Maldives and over 200 whale sharks have been identified in South Ari atoll. Each have been tagged by the Maldives Whale Shark Research Program and even named after. Getting the chance to get close to this giant fish is a once in a lifetime experience and a definite number on your bucket list scored in the Maldives. Reserve your experience with at Maafushivaru. Grab your fully charged camera, a towel and some positivity to make most of this breath-taking opportunity with their professional crew.